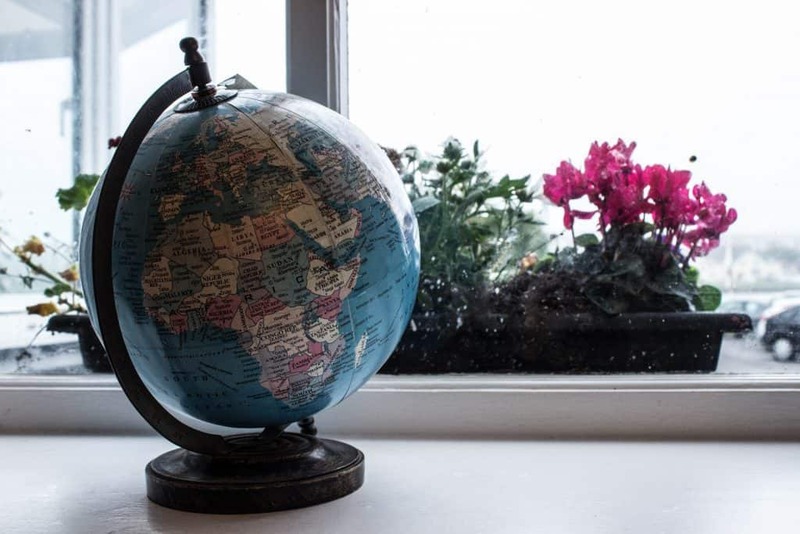 Before heading to Ireland and up until we arrived in Dingle, I heard from many folks that Dingle is quite possibly their favorite spot in Ireland. 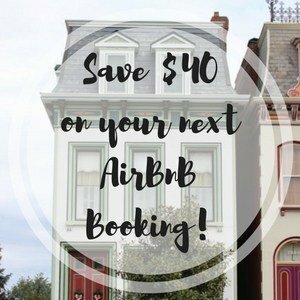 Even our Airbnb hosts in Limerick said that the Dingle peninsula is their favorite spot in Ireland. 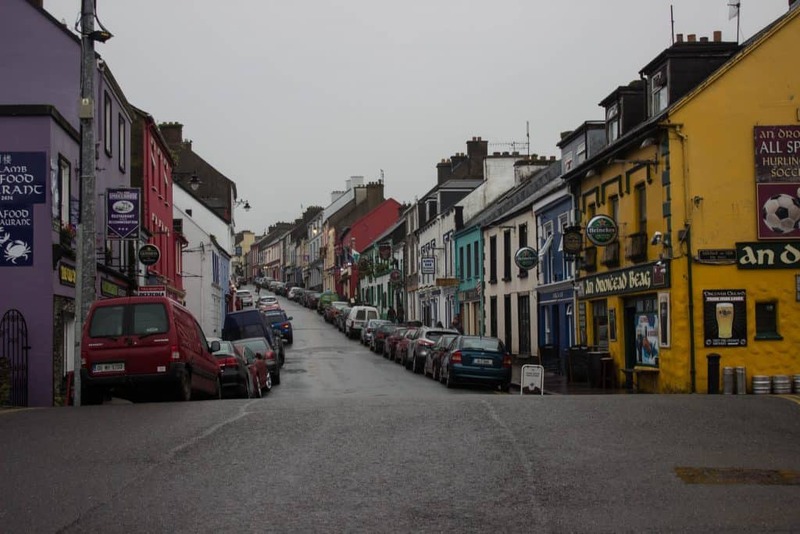 However, maybe you’ve never heard of Dingle? 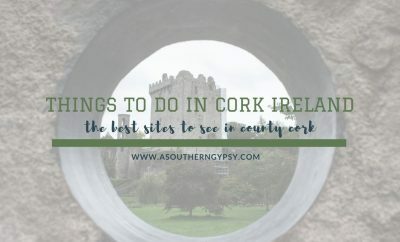 It is one of the most charming towns I’ve been to and definitely one of the most charming in all of Ireland and surrounding it is some of the best scenery in all of Ireland. 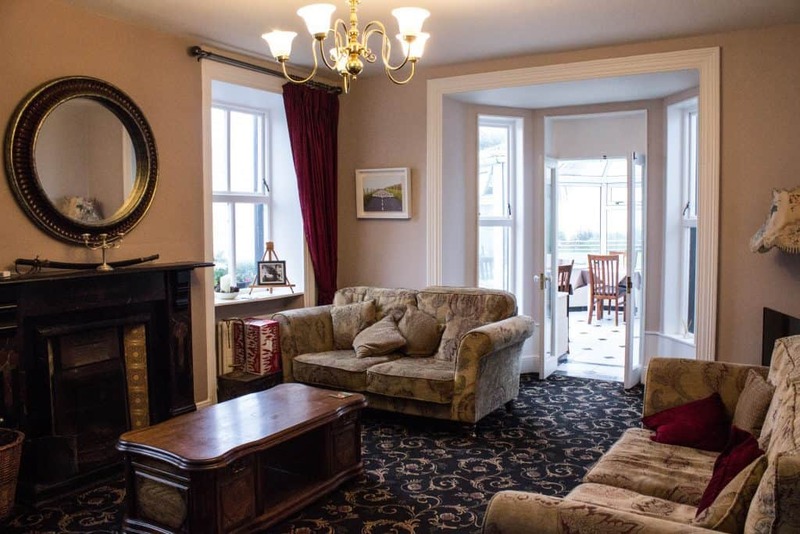 One of the first things to think about before visiting Dingle is figuring out where to stay in Dingle and luckily, I’ve got you covered! 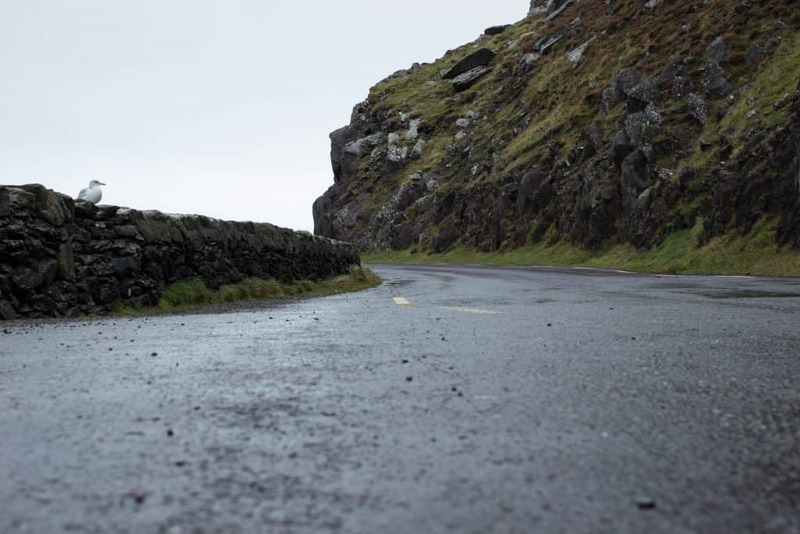 The Dingle peninsula is one area I would absolutely insist you visit on your road trip in Ireland. Before heading to our accommodation for the night, Milltown House, we drove around the Dingle peninsula via the Slea Head route where we were able to experience stunning seaside cliffs, sharp and somewhat scary turns, Star Wars film sites, untouched land and all the signs in this area are still only in Gaelic which gave it a true authenticity. 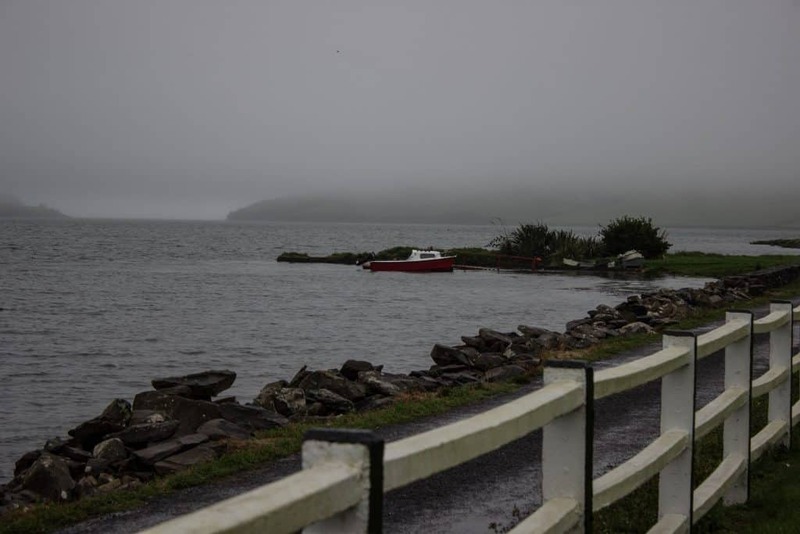 After arriving in Dingle, we headed to go on our tour to see Fungie the Dolphin – a local dolphin that has made the town of Dingle home for decades and is beloved by locals and visitors alike. Unfortunately, the weather was not on our side this day and we had to give up any chance of seeing Fungie. 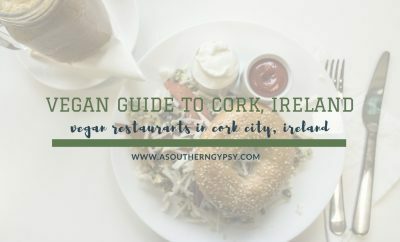 More reasons to return to Ireland! Instead, we wandered around town looking at shops, finding some vegan food and taking photos of this adorable, colorful town. I even saw Dolly Parton – okay, okay. I only saw her star. 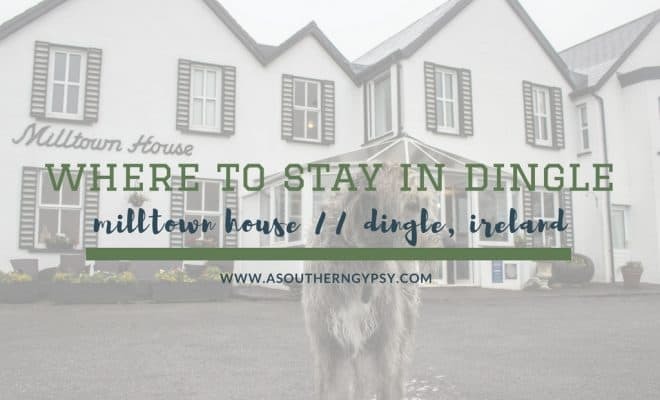 We checked into Milltown House and hunkered down for the evening because it was so cozy and charming and honestly, probably because of the two Irish Wolfhound residents. 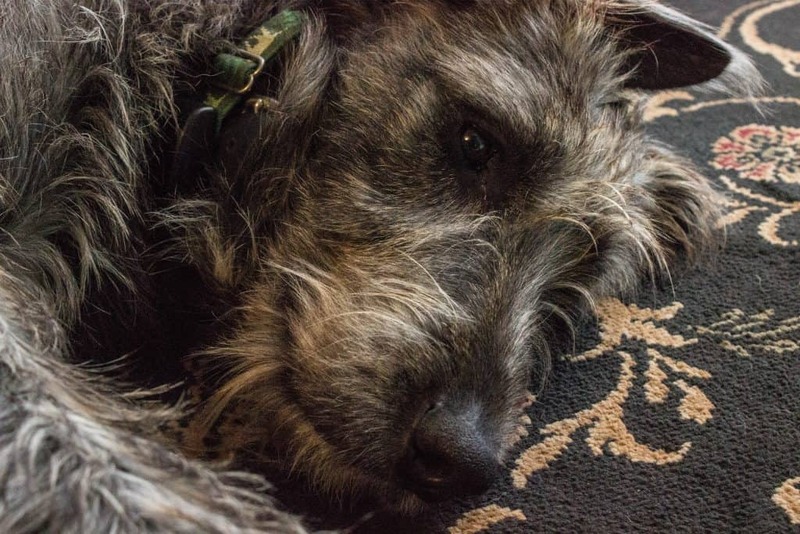 I actually have always wanted an Irish Wolfhound so this gave me a good glimpse of what it would be like to have one in the house and let me say – they are my kind of dog! Huge and completely lazy. 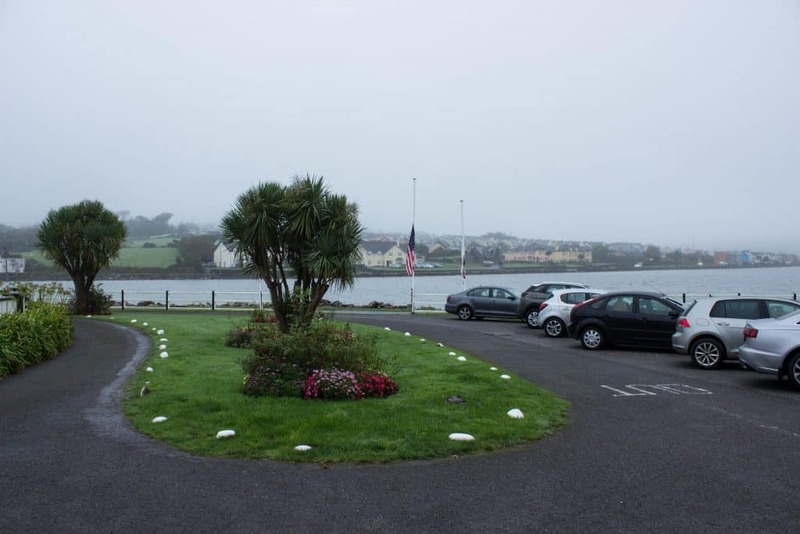 Milltown House sits on the edge of the bay in Dingle giving it a head-on view of the town and the waterfront and has plenty of parking for your rental car. 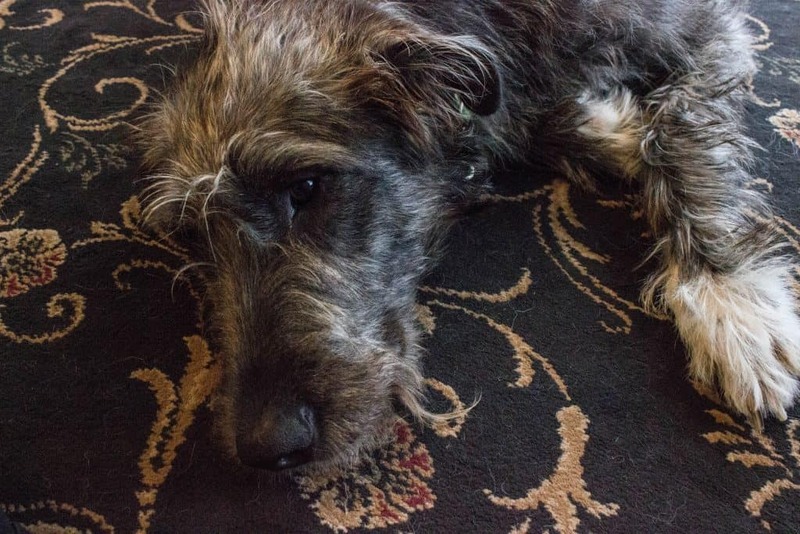 We were immediately greeted by Seamus and Saoirse – the most adorable, shaggy, grey dogs I’ve ever seen. 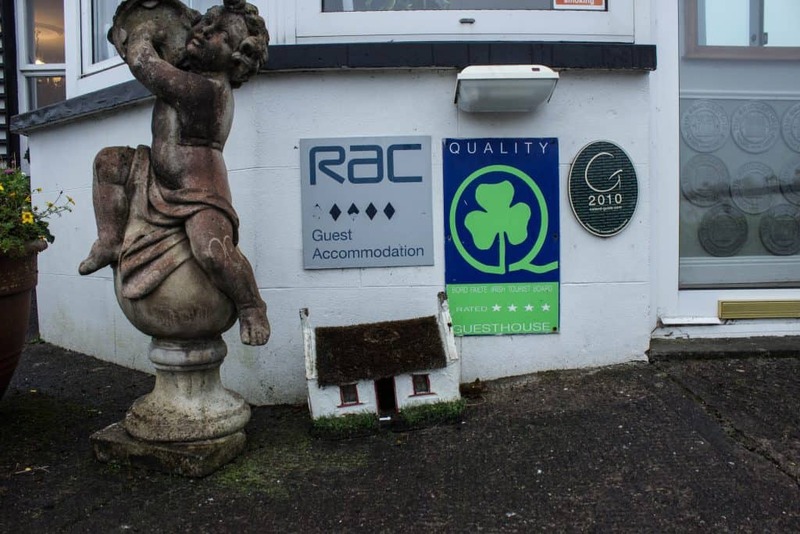 The staff also greeted us, showed us to our room and offered us a pint from the bar. 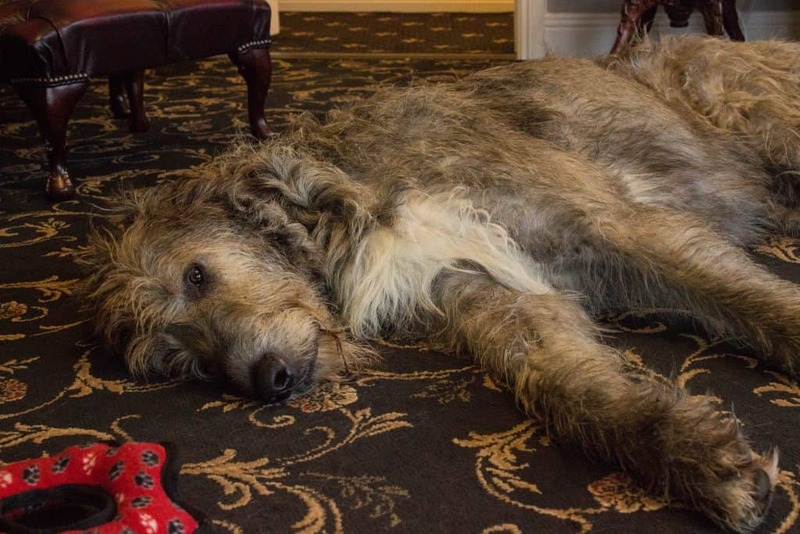 There are plenty of areas that everyone is allowed to use whenever they want – as long as you like the company of Seamus and Saoirse. There was the main living room that you enter when you first walk in and this was the main camping ground for the dogs. 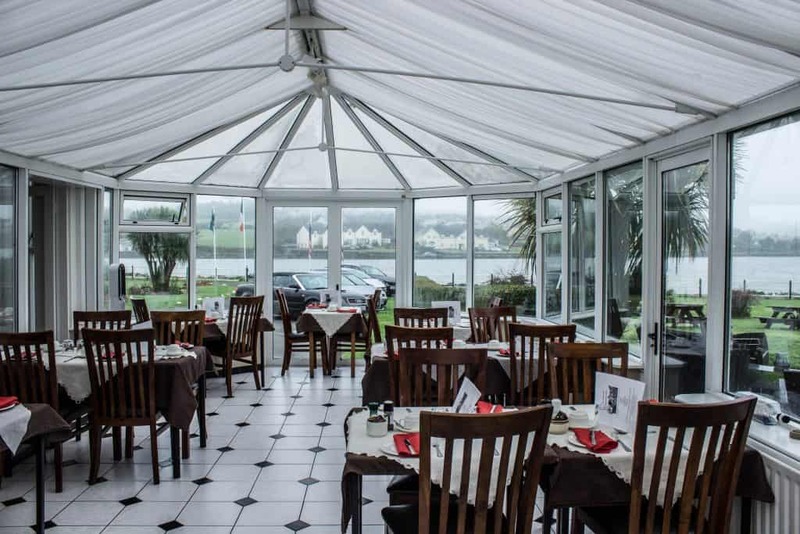 See reviews for Milltown house. Next, there was a very comfortable and cozy sitting area with a fireplace and plenty of sitting space. We both got our laptops, some snacks and got to work for a few hours. It was the perfect place to relax and get some work done. 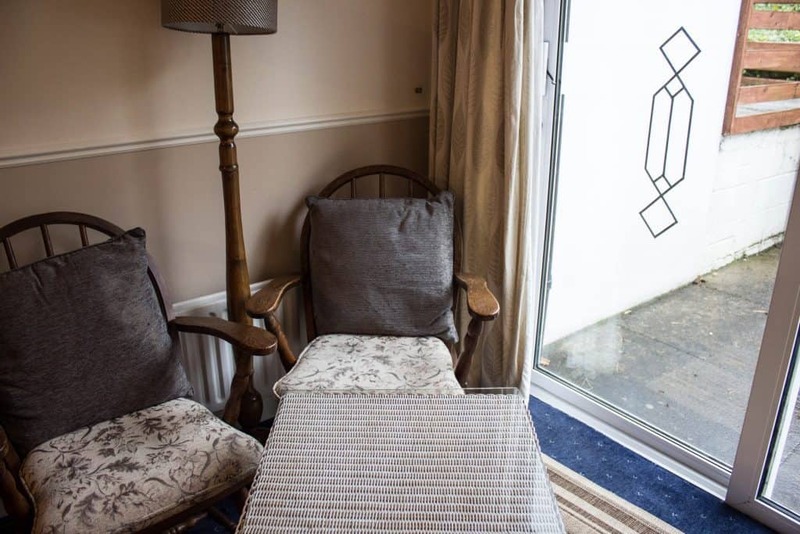 The next room is the dining room which also feels like a sunroom with its lovely glass roof. We had to leave super early the next day so we didn’t get to partake in breakfast but I bet this room is a great way to start your day. There is also a small bar and lounge area where you’ll be able to get your favorite drink of choice. Our room was downstairs (thank goodness -because my bag was starting to get heavy by now!) and was just near the main living area. 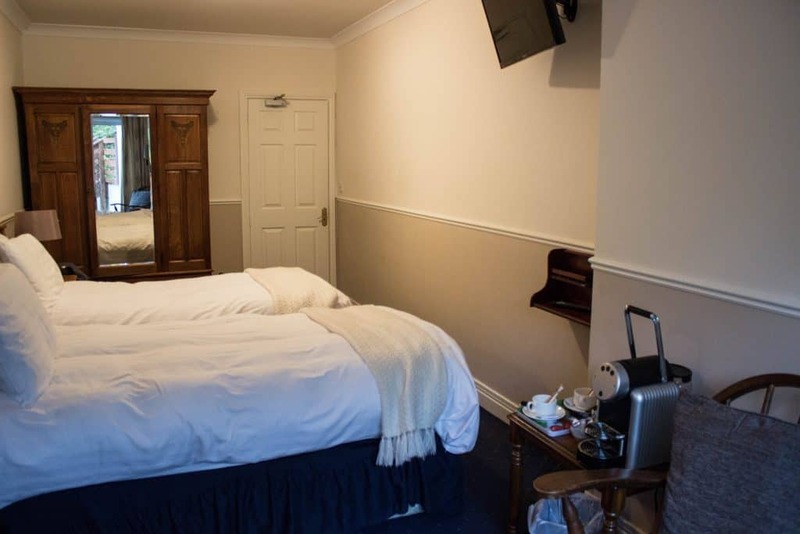 The room came with two beds, a large antique armoire, a small sitting area, fully equipped bathroom and a wonderful private patio outdoor area. 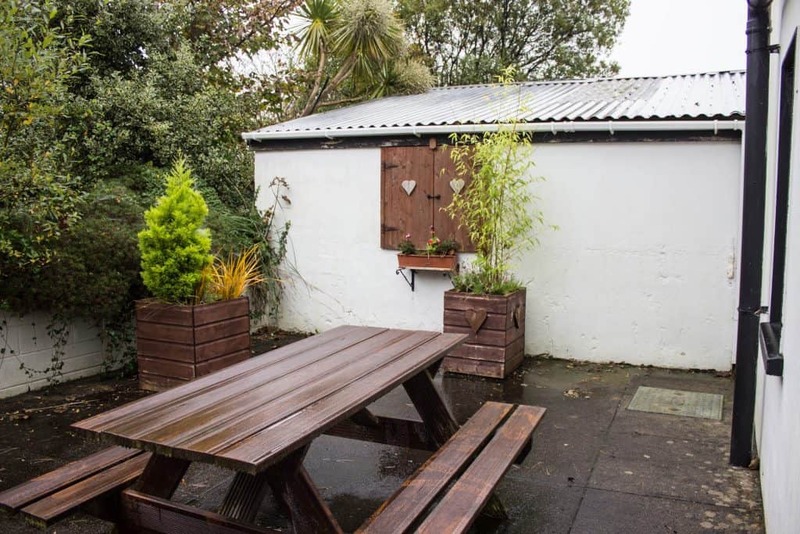 I really wish I had more time to truly enjoy the private patio area – it would be the perfect spot for a picnic! 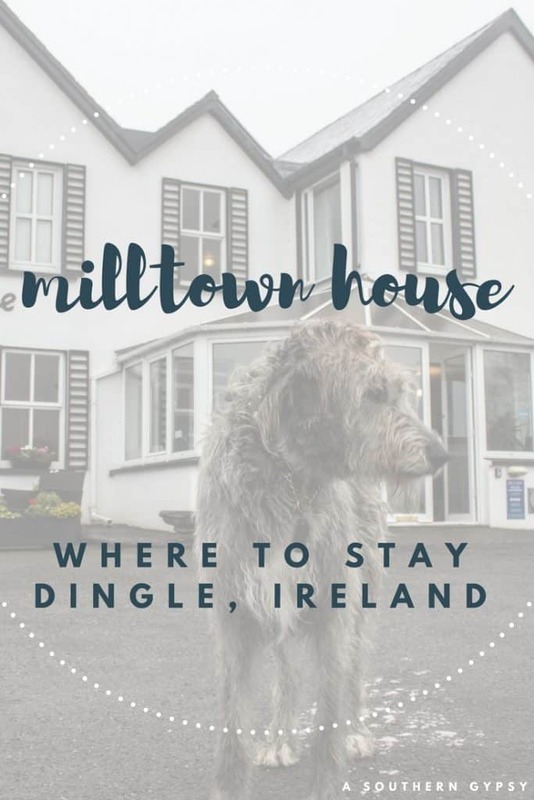 I would absolutely recommend a stay at Milltown House and would stay here again in the future! 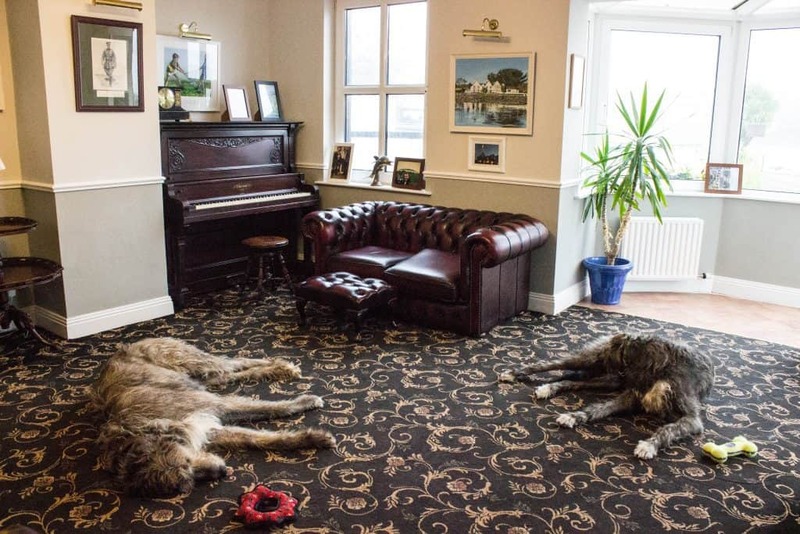 The rooms were comfortable and accommodating, the extra common areas were nice for getting work done, the wi-fi was fast and the staff (both human and canine) were welcoming and friendly! 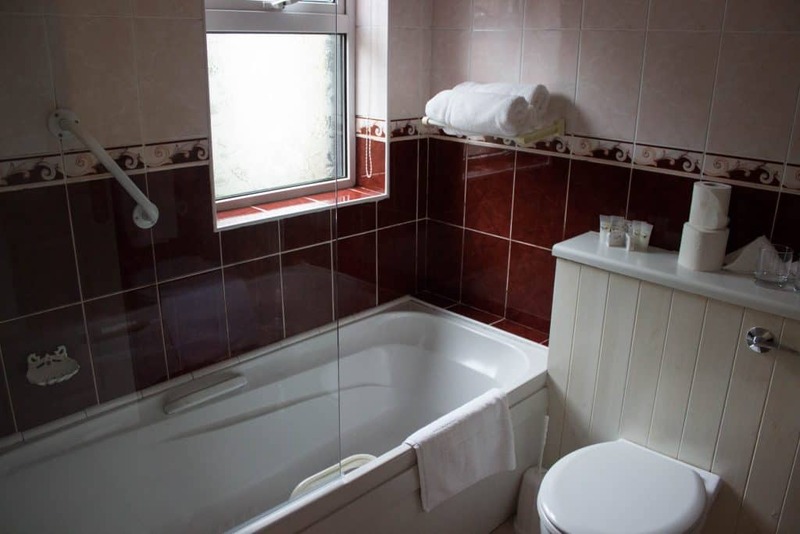 Have I convinced you where to stay in Dingle? 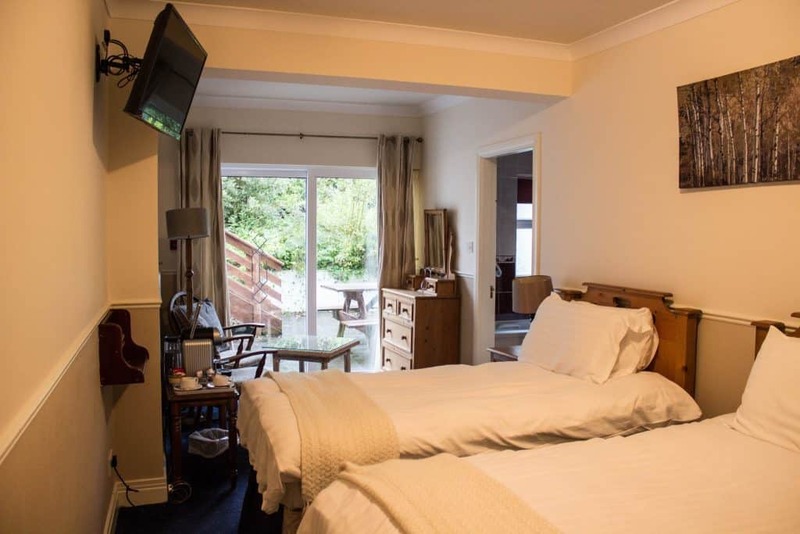 Check out reviews here or go ahead and book your stay here! 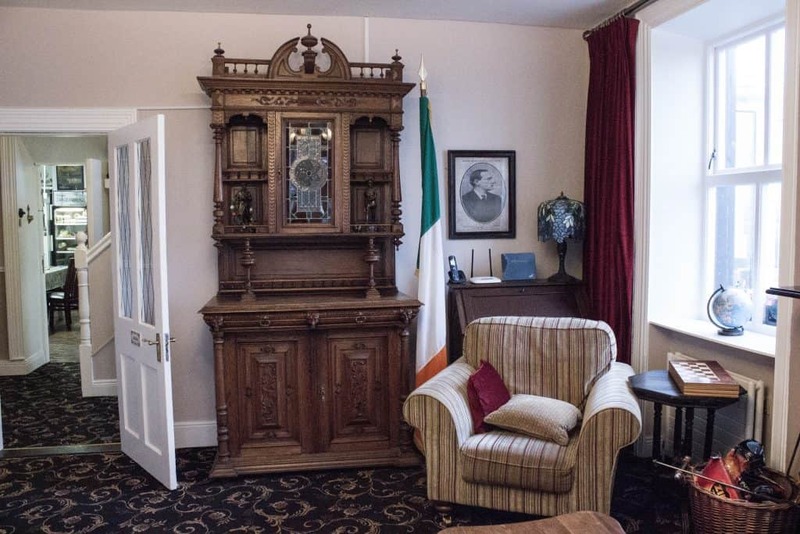 Thank you to Milltown House for hosting me on my stay. As always, all opinions are my own and I will never promote something I don’t personally use and believe in, regardless of who foots the bill. me really want to go. It looks absolutely relaxing and refreshing in every way. 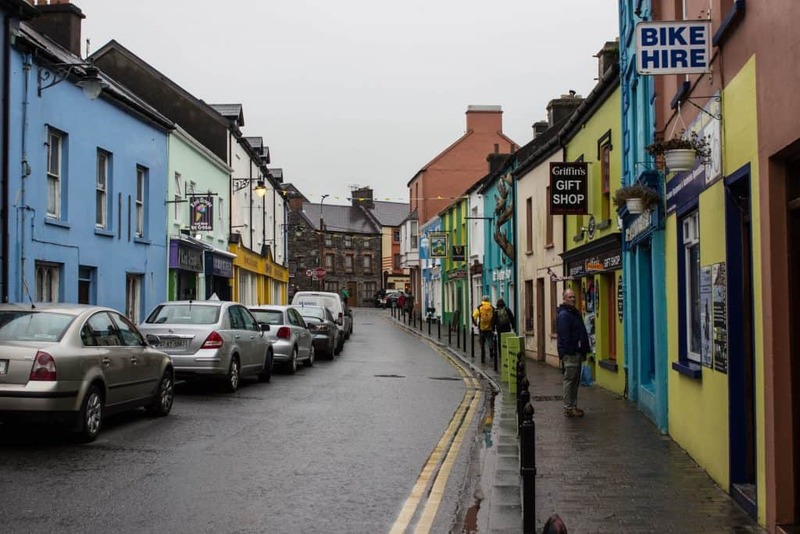 Dingle looks great 🙂 — what a cute town. 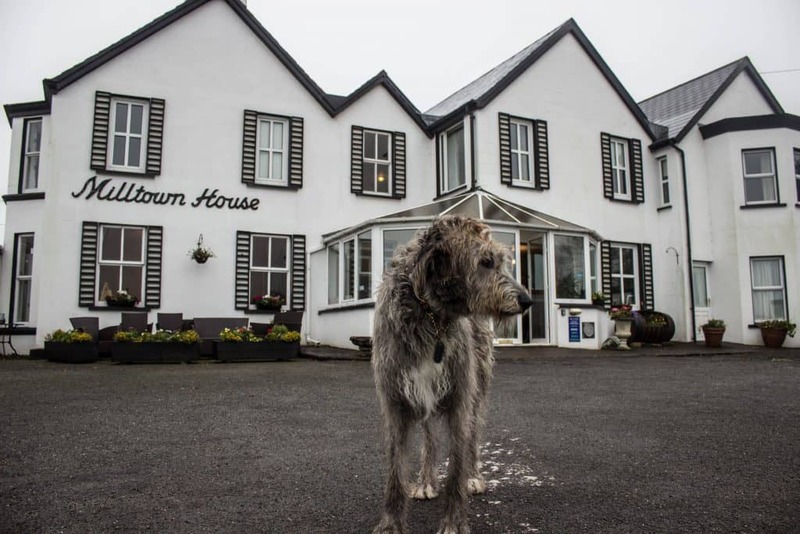 The Milltown House looks like such a cozy place to stay — everything you need, AND two Wolfhounds to keep you company. 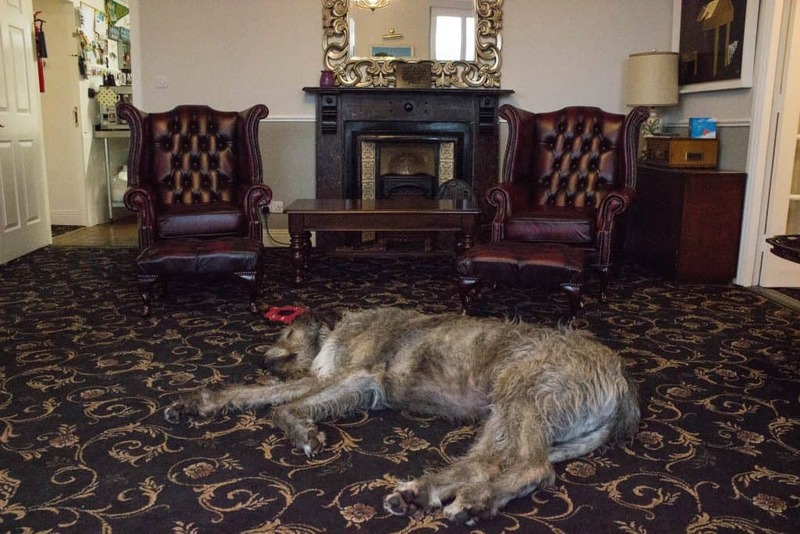 I would love to bring my daughter for a stay here, although she’d be tempted to take one of the dogs home! What a cute hotel! Looks so cozy and charming. Love that it has a view of both the waterfront and town. 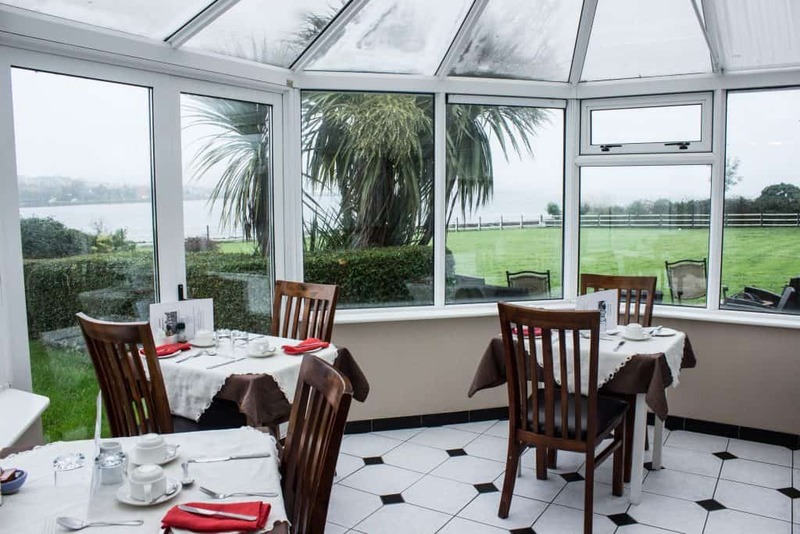 And the sunny dining room looks like the perfect place to enjoy breakfast. Great find. I have not heard of Dingle! 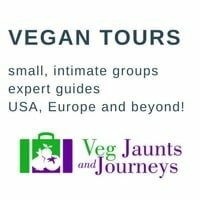 But after reading your post I know where to go if I plan a trip to Ireland. 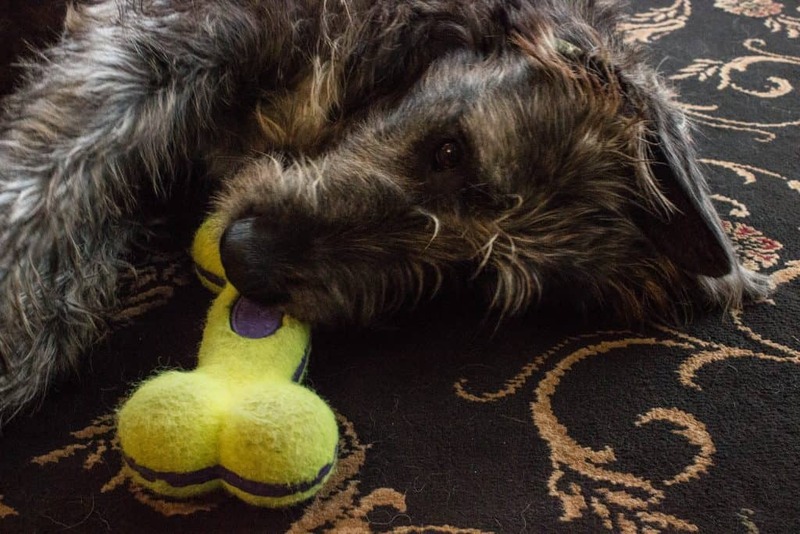 Love the guesthouse with their cute dogs too. 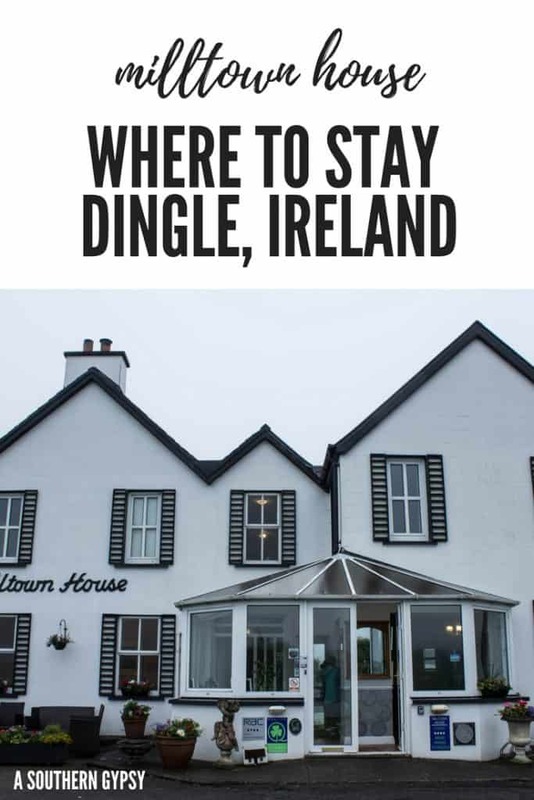 I haven’t heard of Dingle other than the fact the the Irish pub near my house is named Dingle House Pub. I loved Limerick. 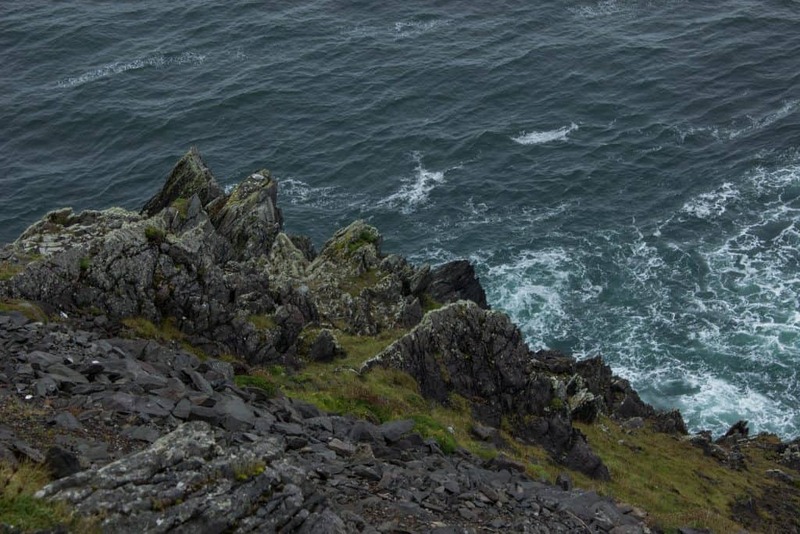 Actually, I loved all of Ireland, but obviously need to go back and see the places I missed. 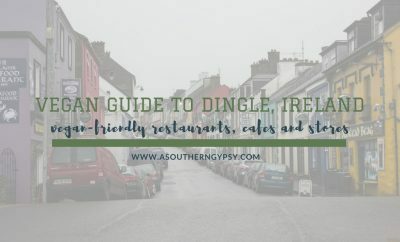 I’ve never heard of Dingle but I would love to visit! Those dogs are adorable haha. For the star thing is that a version of the Walk of Fame? 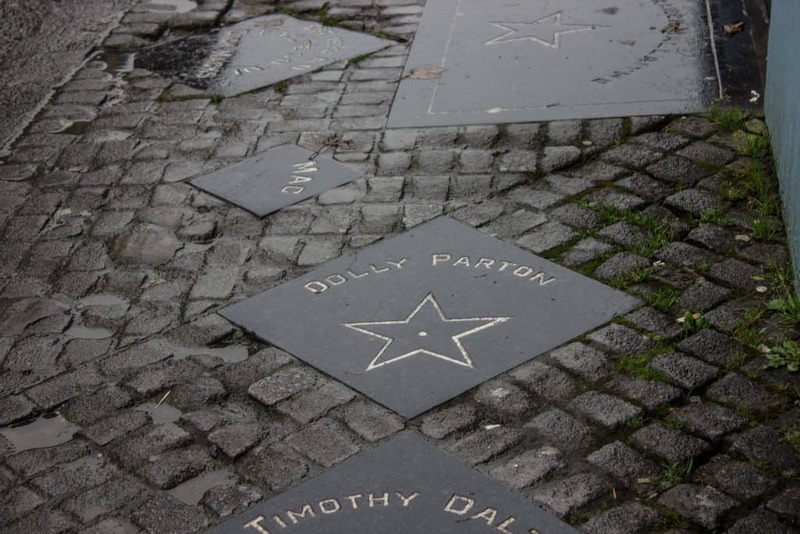 I wouldn’t have expected to find a star for Dolly Parton in Ireland! 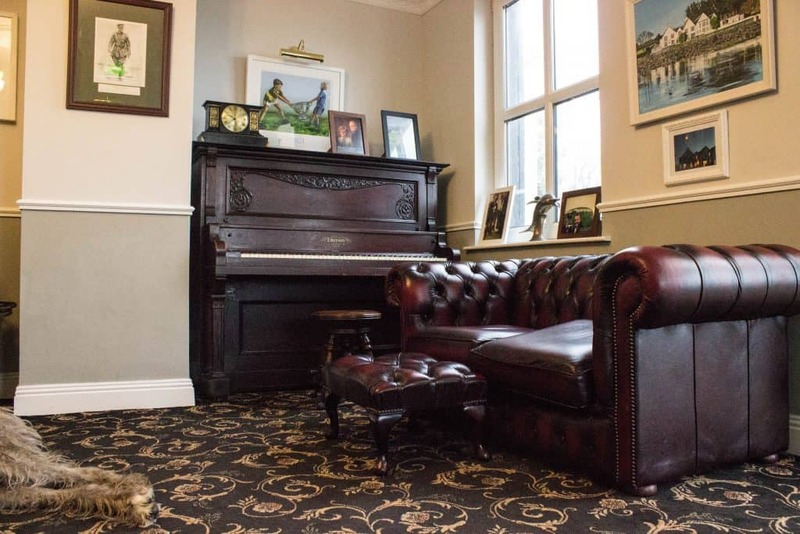 What a charming hotel. I like the sunroom with the glass roof! It must be a great place to enjoy breakfast and start the day. I like how it looks out to the ocean too!